Afghanistan has experienced close to four decades of perpetual violence and wars, political upheavals, and religious and ethnic conflicts, resulting in millions of Afghans fleeing for protection to neighbouring countries, primarily Pakistan and Iran. In consequence, after the first exodus in 1979 and followed by waves of refugees, Afghans turned into the largest global refugee population. This changed only last year, before the Islamic State (Daesh) started its ‘Jihadist genocide’ in Syria and the local multi-dimensional armed conflicts reached a regional unprecedented level of intensity and brutality. Since the fall of the Taliban regime in 2001 and hopes for peaceful and socio-economic prospects, some 5.7 million Afghan refugees turned home, marking almost one quarter of the entire population. But in the current migrant crisis, Afghans make up to the second largest group in Europe, after the Syrians. This pertinent issue raises some crucial questions: First, why again an extraordinary huge number of Afghans decided to flee their country? Second, what measures does the Afghan government and the international community need to take to stop even more Afghans from leaving their country? Basically there are several mutually enforcing reasons that quantify as to why Afghans are again entering the refugees trail in a large scale. First, Afghanistan suffers from a sharply deteriorating security situation. This is mainly due to the massive return of the Taliban and the expanding activities of ISIS and other Jihadist groups which led to a tremendous increase in terrorist attacks leading to an extraordinary high level of civilian casualties. Secondly, there is a rising influence of Islamic fundamentalist clerics in state and society, pushing towards Islamization and the eradication of all achievements made in the last decade in terms of women and girls’ rights, human/fundamental rights and the general situation of the civil society. Thirdly, the people are disenchanted about the democratic and economic performance of the country. Especially, due to the corrupt and nepotistic governments of former President Hamid Karzai which truncated and violated any notions and fundamental principles of ‘liberal democracy’. Fourthly, the western engagement in the country produced a new generation of Afghans, which are not only skilled and educated, but also socio-politically much aware. Inspired by the new potential opportunities, these Afghans had much hope for a better life and high expectations on an economic, social and politically prosperous Afghanistan which is freeing themselves from the shackles of the past. Subsequently, the Afghans are not only deeply afraid but also much disappointed about socio-political and economic prospects of the country. In other words, the people fear a fall back into the erstwhile living conditions as suffered under the Taliban regime. Fifthly, the fact that more and more areas are under control of the Jihadists and the fruitlessness of peace negotiations. For the Afghan government’s willingness to continue the peace negotiations (despite all former failures) with the Taliban is making Afghans extremely insecure. Here, it seems that Pakistan’s government and especially its security agents are continuing its traditional support for the Taliban. This will make it even more complicated for the Afghan armed forces -which achieved some success in fighting the Taliban (and other militant groups) but are still nascent and insufficiently equipped- to guarantee security. Sixthly, it became increasingly clear that the transfer of power from the NATO/ISAF to Afghan authorities looks rather like shirking than shifting of responsibilities. By having said that, one can identify much frustration among the people that the new government has no capacities to improve the security situation and no political will to bounce back the influence of the fundamentalist Islamic clerics in the political-administrative state structure. Seventhly, Pakistan’s and Iran started to expel thousands of refugees (around 130.000 since beginning this year only from Pakistan) and pushed them back into Afghanistan. Finding themselves in meagre and hopeless living condition, these refugees will join increasingly the refugee movement towards Europe, in rising numbers taking the couple of millions Afghan refugees in Pakistan and Iran into account. Finally, against the backdrop of the dramatic situation of the refugees trying to enter Europe as well as the internally displaced persons who are on the edge to leave the country too, it is most crucial to deal with the puzzle of necessary steps that need to be taken to stop the exodus of Afghan people. From a short term perspective, there is not much the government of President Ashraf Ghani and Chief Executive Officer Abdullah Abdullah can do to stop the speedy flight of the Afghans from the country. However, it must work towards the fulfilment of its agreed international conventions, especially, regarding human rights, protection of women, and civil society organizations. These commitments got mostly ignored by the Karzai administrations which added to the lack of trust of the people in the government and gave Jihadists much room to entrench their influence in the country. In this direction, the Afghan government need to take a much harder stand to protect the constitution as well as to ensure the rule of law, and spend much more efforts to contain the influence of the Islamists within state and society. Against this backdrop, it is also clear that peace with the Taliban is not possible and that they are not willing to accept any democratic principle or procedure. Therefore, the administration should stop any negotiation with the Taliban which is adding to the fear of the people about Taliban seizing more power, outside as well as inside the state structure. The recent announcement that the international leadership dispute within the Afghan Taliban movement is solved rather led to more concerns than creating hopes towards a substantial peace process. 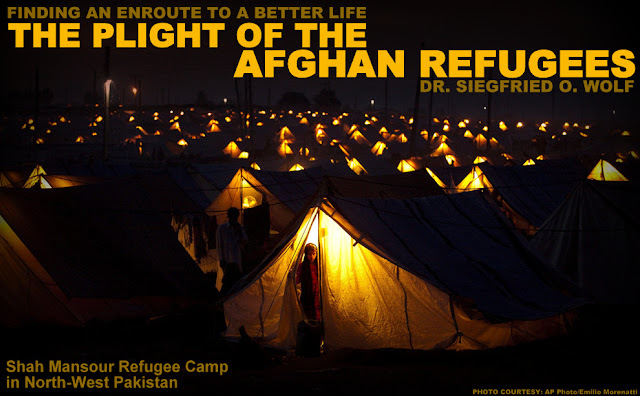 Last but not least, the Afghan government with the support of the international community especially, China, which developed over the last years a keen interests on Afghan domestic politics – must find an agreement with Islamabad to stop the expulsion of Afghan refugees from Pakistan which still shelters 1.7 million registered refugees. Also, the new Washington-Teheran rapprochement should be utilized to convince Iran (still accommodating at least 1 million refugees) to loosen its tough rules to discourage more arrival of refugees while pressurizing their current refugees to leave the country. In this context, the United Nations High Commissioner for Refugees (UNHCR) should strictly apply the conditions of its Solutions Strategy for Afghan Refugees (SSAR, the main regional policy framework for sustainable reintegration of those returning to Afghanistan). The violations of the notion of voluntary repatriation possess the imminent threat that the SSAR is supporting the anti-refugee practices of Islamabad and Tehran. Furthermore, it determines a challenge towards the successful implementation of SSAR initiatives regarding sustainable reintegration of the ‘returnees’. However, an increase of ‘returning refugees’ would worsen the overall situation for internally displaced persons in Afghanistan and subsequently enforcing the exodus of Afghans.